As you've probably noticed, Mario Kart 8 Deluxe is out this week - the re-release / expansion has been critically acclaimed; as we argued in our own review it takes a brilliant Wii U game and makes it even better. It should in theory help boost Nintendo Switch hardware sales, but the system's already doing pretty well and can be hard to find in some territories. GameStop, still sold out of the systems on its US website, has today confirmed that it's received some supplies ahead of the karting game release. It's described as "a limited supply" and will sell at the usual $299.99USD, but only in stores - customers are encouraged to visit or call their local outlets to see what units are available. In the press release it's stated that the stock isn't expected to last through the weekend. In the meantime, the familiar $200 credit deal is still available on Switch purchases until 30th April, which means handing over another system could get you the Switch for $99.99. To make a Nintendo Switch purchase even more affordable, GameStop is offering up to a $200 credit when a customer trades in a PlayStation 4, Xbox One, new Nintendo 3DS or Wii U (32GB) and applies the credit towards the purchase of a Nintendo Switch. This offer is currently available and runs through Sunday, April 30. Are any of you in the US planning to try and grab a unit? Let us know in the comments. Nope, system still doesn't exist around here. I definitely will buy one now, debating whether I should trade in my Wii U or xbone. I don't generally love GameStop but this is de why. I got my launch day preorder by trading in my Xbox one(which was a Christmas gift then to be fair I played only with titanfall2) and my original 3ds phat, and ensued yo getting the Switch a carrying case and Zelda for only $63. @Joeynator3000 This stock is only in stores, do your local outlets have public numbers you can call to check? I haven't touched my 3DS XL, my 2DS or my New 3DS XL since I bought my switch. Does anyone know if I can transfer my games from my New 3DS XL to my 3DS XL or 2DS without losing any of the digital games on either system? If I can I'd be happy to give them a system that doesn't get played anymore plus $99 for a second Switch. @ThomasBW84 I assume he used the store stock checker for his local stores since he said "around here"
At least they're selling them straight up and not going for the $600 bundles again! @Fred13 You won't get $200 for a New 3DS XL. The details say "up to" so it's probably only a ps4 pro or a 1tb base console or something. @SDF honestly, if your xbone uses external storage I'd say that because I see any data and games downloaded to that transferring to the next system up as long as you plug in the storage. I see Nintendo requiring you to have your Wii U to transfer your purchases to your switch. @Menchi187 @Joeynator3000 For high-demand items like this, Gamestop has in-store stock that isn't visible online (so you have to go to a store to buy it). They did the same thing with a lot of their pre-order stock. No wonder why I been noticing Wii U systems all over my local GS stores. Good deal! @ThomasBW84 Yeah you're able to see which stores has what online, and all the stores around here are empty. Before people get excited, it's important to recognize the "up to" caveat that @Menchi187 mentioned as well. I highly doubt Gamestop will give $200 for a used New 3DS or Wii U. I'd imagine something like $100 for New 3DS and $125 for Wii U. Then maybe $150 for Xbox One, $175 for PS4, and $200 for PS4 Pro. New stock is good for everyone... except me I got my switch launch day! Only launch outside the christmas season yet it was colder then the rest but worth it. @ElekidDude I had a quick look at the US stock checker (I'm not american) and it's very different here. The system for it in Ireland is stupid. As someone who has had to help them fix it and make changes several times to it while I was there, I can confirm this about the Irish system. Whatever shows up on the website is technically in stock. There may be 100 units in store A with 100 preorders in store A, but they are still on the system as in store, so they'll show up as "in stock" on the website. It literally shows the amount that is still in stock and not defective, regardless of preorders, etc. Amount of stock available for preorder doesn't exist here, it's literally "take as many preorders as you can, we'll cancel what we go over by". Also, all of this info is 1 day removed, because it isn't live here. It's all updated after the store closes and you shut down the till and send the sales info to head office where everything is tallied and changes are sent back out. That was fun around christmas when we were the only store in Ireland with a SINGLE copy of Lego City Undercover on WiiU in stock and it sold at 9:05am, and I had calls every 2 minutes about it. @Menchi187 good catch thanks, I still might be interested in doing it if Nintendo will allow it though. @Fred13 Their transfer systems are bad enough when doing them the conventional way (Wii -> WiiU, 3DS/3DS XL -> New 3DS XL) and the rest was (last I checked) either impossible or incredibly stupid. My friend bought a WiiU in 2013 and sold it a few months later. He got a cheap 2nd hand WiiU in December of 2016. He tried to put his old account info on his new WiiU but couldn't because the ID was linked to the console hardware (as Nintendo still foolish loves to do) and when he contacted Nintendo, they told him the only way to do it was if he sends in the old WiiU and the new WiiU and they'd do it for him. I don't shop at GameStop anymore. I will not sell my systems for another system. I wouldn't have a way to play my Wii U games. @Joeynator3000 Demand is so high that people call and investigate when shipments are coming in for local stores and line up right when they arrive. As such, the stores will never say they have any "in stock" online because the few they get are essentially taken before they even arrive into the store. Your best bet is to call and find out when each store's next Switch shipment is coming in and plan to arrive when or before the delivery truck does. I have my launch day Switch but hoping the new shipment brings with it more standalone colored joycons. I'll need a second set for Mario Kart and Puyo Puyo and can't bring myself to get the boring grey ones. @SDF I kept my Wii U. Too many games I still haven't finished like Windwaker HD and Xenoblade Chronicles X. Plus the Virtual Console. Had Switch been at least digitally backwards compatible then I may have traded in my Wii U...but for now, I'm keeping it to play all my Wii games and the aforementioned games above! I called my local GameStops and they have no idea if and when they are getting new Switches. Though one employee was optimistic and said that they might get a few units on Friday. I don't trade in my systems for anything, especially not for the latest and newest thing. Called around and managed to snag the last one from a local Gamestop. The next store over had several in stock. Today is a GREAT day to get one if you've been having a hard time! @DarthFoxMcCloud I felt the exact same way Still love my Wii-U. Decided to jump on getting a Switch for my kids after my buddy brought his over and they fell in love with it. All the GameStop's in my area had them available today , but every single unit sold out within the first hour at every store . The demand is crazy for the Switch . I tried trading in my Wii U for the deal and there was about a 1" scratch on the bottom. Said he had to sell it under refurbished and only give 100 for it, so I had to pass on that deal. @Slim1999 It's already confirmed from Nintendo that games are tied to it too. Your account ID has to match the hardware ID. Nintendo have said it, thousands of users have confirmed it post launch. 5 seconds of google-fu woulda saved face for you. My two local EBGames/ Gamestop stores have had stock on the normal grey joy-con Nintendo Switch bundle off and on the last month, and I've had the chance to buy the system easily, but I didn't bother because I'm going to wait for a lot more games to release before diving in. As for the Neon Blue/ Neon Red Nintendo Switch bundle, that thing is extremely hard to find where I live. Still have a ton of Wii U games left to finish as well as VC and XB1 games to play. I can wait for a Switch. Will get one Fall/Holiday 2018. Should be plenty of stock by then. Gamestop had a pretty generous trade in program awhile back where they offered 50% more trade credit when you put it toward a pre-order for a Switch game or accessory. Allowed me to pre-order MK8D and Splatoon 2 for cheaps. I got $125 for my 3ds phat at launch. It was in good. Indutuhn I take care of my consoles so not sure if that helps. Just stopped by my local GameStop and they are out again was gonna get my Mother in law a system she is a Mario Kart fan said they sold the last one right before we got there . I called about neon joycon and my local GS said no systems today, they had stock on Monday. Gamestop is garbage. They are selling them in bundles for $499. They are trying to milk the consumer. My friend tried to get one there. He had bought Zelda and Bomberman at Amazon. They would not sell him the console unless it was a bundle.It would be a shock if they sell it for $299. Like Thomas said call first because they are thieves. @MarinaKat If Gamestop try shafting you on something like that it's worth trying another one (if you live near multiple stores). I traded in my DS Lite for the 3DS back in 2011. The store manager tried telling me there was an issue with the calibration of the touch screen - which was absolute nonsense - so they could only give me $30 for it. I drove to the next Gamestop and the girl there told me it was in perfect condition and gave me $100 in credit towards the 3DS. Not only is there a lack of consistency between stores but some of the less ethical managers actively set out to rip you off to boost their store's sales figures. P.S. I have always regretted trading my DS Lite in. I loved that thing and felt guilty afterwards, like I let it down or something. Better to save up the money to buy a new console than trade in a beloved system. but you can buy a used new 3ds XL for 180 - and then get 200 for trade? huh? I don't buy new from Gamestop. Would never trade in one of my systems to buy another. For about the last two weeks everytime I have visited my two local WalMarts they have had Switches in stock. I think I'll try my luck getting one from McDonalds. I might chronicle the next month of eating from there and call it "Fooligan gets Super Sized" or something. 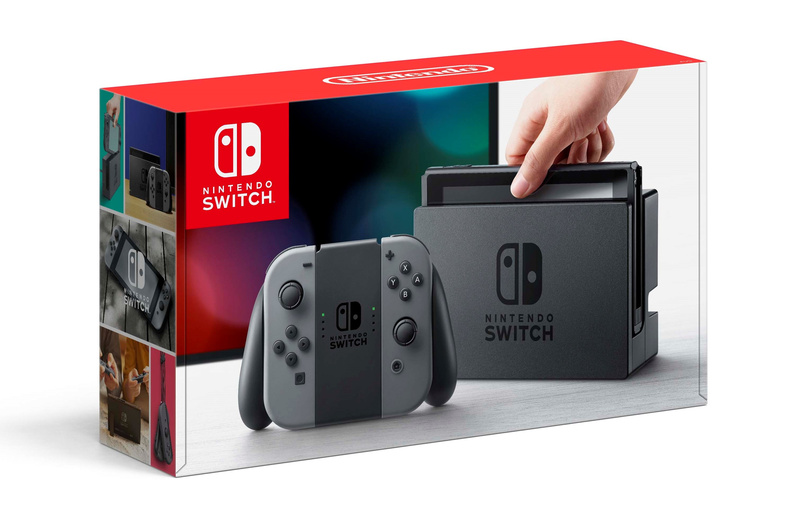 My local store made a bundle of the Neon Switch and MK8 at US$550. Not bad, but the the price is still quite high here. Still, I think I'll get that bundle. Buy $180 & Sell $200 ?? @Rumncoke25 this was how i got my Wii U. They ran great deal to trade a PS3 in towards new console, so games all got sold on eBay and system + controllers I got $200 for. Wii U was free and I ended up getting a used PS3 for less a couple years later just to play dark souls 2, last of us and couple others before selling for almost the same I paid for it. That's all anything that isn't Nintendo is good for, in my opinion of course. Perfect opportunity for some Wii U owners to upgrade and get themselves in good standing for the onslaught of games coming over the next 5 years. Of course, if one can afford to purchase a new Switch and keep their Wii U, that's obviously the most ideal scenario. Actually, that's incorrect. With Switch, Nintendo has a new system in place where your games are tied to your Nintendo Account. If you sell your system, and repurchase a new Switch years later, all you do is sign in under your Nintendo Account when initializing the system, and you can re download all your games. @JaxonH Find the follow up article about a week or so later when Nintendo clarify the workings of it. I got a set of grey, red and blue Joycons, and preordered the yellow, and grabbed a spare grey set for my multiplayer pro bag. But now I need those Surge Joycon grips for playing with them sideways... got a pair of grey and they were so amazing I took them to work, and preordered the red, blue and yellow for a matching set of each Joycons. But I want another 2 grey sets for the multiplayer pro bag, and they're sold out everywhere. Sold out sold out sold out sold the freak out. That's how you're gonna feel about Switch... times a thousand. You're in for a treat (whenever you do get one). I feel more attached to Switch after a month than my Wii U after 5 years, and I love my Wii U. That simply stated games can only be played on one machine at a time. And you can't just sign in and download, you have to initialize the system first, and when you do you'll lose access on the first system. No, it's not as good as just signing in on any system whenever you want, but it is definitely not tied to the hardware, and you most certainly can redownload your eShop purchases. It says right on the Switch itself when you initialize the system, as seen in the pic in that article, "eShop purchases are tied to your Nintendo Account"
@JaxonH I stand corrected. I expected "at a time" to be usual Nintendospeak for not meaning what it actually means. Just wanted to make sure correct info was being shared. It actually seems you may not even need to initialize, but just go into eShop, deactivate your Nintendo Account from Switch A, then link it in eShop on Switch B, download games and play. Ooh, I'll call my local GameStop then! Are you in the US? Amazon has grey joycons for $72 and buy.com has them for $65. @JaxonH I agree with both of your replies. I love me some Wii U but the Switch is too amazing. I freaking love it. And yeah, I find the grey joycons everywhere here in Utah but no trace of the colored ones anywhere. Guaranteed there will be a lot in Virginia towards Roanoke and Blacksburg come Friday. They seem to get them by the dozens at best buys and gamestops. If you live in the area, keep your eyes peeled in the next 48 hours! @diditall4tanooki Sounds like something they would do, I did pass on that bum deal and ended up selling for a fair price online instead. That's why I never shop there anymore, but they were the only ones in town with a Switch right then. It's easy to get attached to consoles, but I had to learn to move onward! Really, for this promotion you were able to trade in your original 3DS for $125? I thought the promotion only said New 3DS systems, not original ones.